Ukrainian President Petro Poroshenko has signed a law introducing amendments to the law on the National Security and Defense Council (NSDC) of Ukraine on improving coordination and control in the field of national security and defense. According to a statement posted on the parliament's website, respective bill No. 1343, which was submitted by the head of state, was adopted by the Verkhovna Rada at first reading on December 11 and at second reading and as a whole on December 25 this year, and then it was sent to the president for signature. On Monday, the document was returned with the president's signature. Under the law, the NSDC is also entitled to coordinate and control the activity of government agencies in the fight against corruption, public security and anti-crime measures. 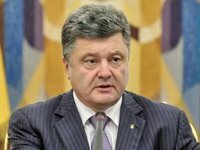 The NSDC can not only present its proposals to the president but also make decisions regarding strategic national interests of Ukraine, improvement of the national security and defense system, reorganization and liquidation of executive power bodies operating in this field, and national security and defense articles of the draft state budget. The NSDC can make decisions on political, economic, military, information and other issues consistent with the scope of potential and real threats to Ukraine's national interests, as well as "the declaration of war, partial or total mobilization, the martial law or the emergency situation." The NSDC can decide on urgent measures in the resolution of national security crises. In the case of early termination of powers of the Ukrainian president, the Verkhovna Rada chairman rather than the prime minister shall be the acting head of the National Security and Defense Council.